Hi everyone, just received my new skates a few days ago. Moxi Lolly boots in purple (taffy) mounted on Arius Platinum plates. I wanted to try dance boots, a new type of plate and have some fun! They skated well on my first trial with some old Atom Juke wheels from my derby days, the ones with faux metal rims and plastic hubs (version 2s?). Then I tried my Atom Venom wheels and the skates were a bit jerky. Weird. I changed to Aussie Scott Super Enforcers... a weird metallic rubbing sound? So, I swapped to Moxi outdoor wheels and they hardly turned. What the??? It seems Arius trucks do not have quite enough plastic(?) lip where the axles stick out from the trucks. The wheels are rubbing against the trucks. The only wheels I tried which were okay were the Atom Jukes and that's because they have a generous wide/high hub. The Aussie Scotts have a clip on the inside edge of the wheel and that rubs on the truck as well. I took the skates back to my local skate shop, Extreme Skates, and skate expert Tom had the answer... one tiny little washer on each axle gave the wheels just enough clearance from the trucks. Problem solved. Easily. But why didn't the manufacturers check this detail before release? Photos to follow. The Answer? ... little tiny washers! Sorry if the photos are not up to standard. I only have an iPhone 5S. The drawback with washers for spacing on Arius is that it tends to put the outside bearing on the thread (smaller diameter than axle). This is what limits the wheels best to use for Arius. Hi HeBeGB, I suppose I'm asking can anyone think of a better solution. Without modifying actual truck hardware, you have found the best solution readily available. The problem with fanjet wheels is that they are not often flush(well they're never really flush, but some truck side bores are deeper than others) on the inside bearing. This extra depth causes issues on Arius trucks. There are quite a few wheels which have that issue. They are not truly "side set". Rollerbones turbos. They have a typical bearing seat width of .280, and their hub pushes the wheel slightly away from the truck, and the bearings are truly side set. Also since the width between bearings is smaller, the outer bearing sits on the 7.94 OD part of the axle shaft, and is not pushed into the 7.3-7.5mm OD hardly at all. There's a LOT that people don't know about arius plates. I got all the info you could ever want about those plates, how to set them up etc. There is a HUGE difference between a proper setup and as one would think to assemble them. I have a product made specially for arius plates you may be interested in. They protect your plates from damage. That knows Arius plates... he has been working on them for a long time. Roll-Line wheels have offset on the inside to avoid this problem. Sorry if the photos are not up to standard. If you need to space the inner bearing out to avoid interference withe the truck so much that the outer bearing gets in the threaded area of the axle then the bearing spacer distance needs to be reduced. On a three piece wheel this is easy if you have a lathe. Chuck the hub up outside facing the bed, tool up a boring device and carefully increase the depth of the outer bearing seat. 1. 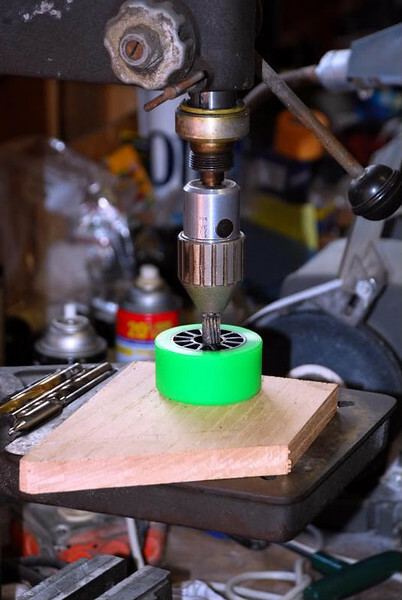 Adjust depth of cut on the first wheel with the spacer in place and lock the drill press quill. 2. Gently and carefully follow the existing bearing bore to remove material to the desired depth. 3. Remove the spacer (wooden block in the photo), place the next wheel and repeat step 2 for all the other wheels. Hi Mort, yes, thank you, Rollerbones Turbos do indeed fit the Arius perfectly. I had a set in my skate toolbox. Plenty of room for the truck. I'll use them and the Atom Jukes from now on. Cheers. Oh, I added the photos the way I always have, but something must have changed. So, no-one can see my photos, except me? This first link is what will happen to your arius plates after some use. They will wear out. I have a fix for all this. It takes some preparation to get a plate setup right, but the feedback, response and performance is great. Additionally, you won't need to replace anything. If you look through some of the links on my Facebook posts there is a picture of my truck where the axis bore is down to the bare aluminum all the way through it. All this can be prevented by using loctite and shims. I have a set of laser cut shims on their way. They are .005" thick. They fit all the arius plates. They go in between the plate and the trucks so the plate is protected. The other advantage is they remove some of the play from the assembly. This means sharper and more accurate turning. This second link is me setting up my friends plate. We modified the trucks, the axis pin sleeves are made of oilite bronze and press fit(one solid unmovable part) to the truck. The shims get a very light coating of loctite 609 between them and the baseplate. The loctite 243 holds the axis pin in. This 4th link shows my original plate after 2.5 years of use(about 700 hours of skating I'd guess). The baseplate is pictured in the first link in this post. It has deep wear into it where the axis pin sleeves pivoted on the plate. And likewise the trucks get the same wear when the truck pivots on the sleeves instead. The solution to keep the trucks from wearing out is to use loctite between the trucks and the axis pin sleeves. This makes them a solid unit like my press fit sleeves. Just without the 100$ price tag lol. You can probably just use blue loctite on it. I used green609 on my friends platinum trucks. However, if you do this you MUST have shims. Because the trucks hold the sleeves in place and they pivot on the baseplate. Without the shims there the baseplate will get worn/damaged. The shims will last for probably 3 years or more before needing replaced. I dont know how long the plastic will last. Maybe 2 years? If you are interested in shims and modifications to make your plate perform better, as well as last a long time let me know. Hi Mort and Wired, thank you both so much for your helpful feedback and expert information dealing with the Arius Plates limitations. I realise now, I am owner of plates which are not as versatile as I expected. The other three pairs of skates I own do not have this issue. I only weigh about 115 pound (53kilos), so hopefully won't wear out the base-plates too quickly - fingers crossed. The action takes some getting used to. I find maneuvering easier with Arius, than with my old Reactor plates. Great plates, I am really enjoying them!